Happy Thanksgiving. I am having pie for breakfast. After we decided to have Thanksgiving at our house, a few weeks ago, I proceeded to procrastinate, until the weekend before. I hastily scribbled a list and went to the grocery store. Run chicken run! I have never made a whole turkey. I experienced a very long moment of panic while I stared at the frozen turkeys at the grocery store. When I left, I had the first round of my grocery items, minus the turkey. I could not figure out how to defrost the turkey on time, and still have time to brine. I gave mash potatoes a lot of thought, but gave up on trying to make the half butter half potato recipe. Thanks for bringing potatoes and chipotle sweet potatoes. You saved the meal. To drink, I picked up Tami Nero d'Avola Sicilia 2011 from the newly opened BevMo, as recommended by a friend who knows Italian wines. It was pretty tasty. I am happy I finally tried and successfully made Jim Lahey's no knead recipe in a pot. His chicken pâté recipe was also very tasty. They were both straight forward and produced good results.Yummy. The turkey, oh the turkey. I mistakenly took out the breast bone, instead of the back bone. Opps. I sewed the breasts together to hold aromatics during cooking. The turkey was brined for a few days with an herb paste under the skin. It was indirectly grilled until internal temperature reached 160°. We would definitely make turkey in the same method, spatchcocked correctly of course, next time. And thanks to N, I no longer fear making gravy. This one is simply made with turkey stock from the breast bone, with a squeeze of anchovy paste. The Parker House rolls were featured in this month's Bon Appetite. I had some trouble following the assembly instruction. So I just faked it and made little rolls. The above items were the fun new trials, the remainder of were tried and true standbys. I hoped you and N enjoyed the meal, we enjoyed sharing the evening with you. The few days of Run Chicken Run was hectic, the resulting meal (and leftovers!) was well worth the effort. 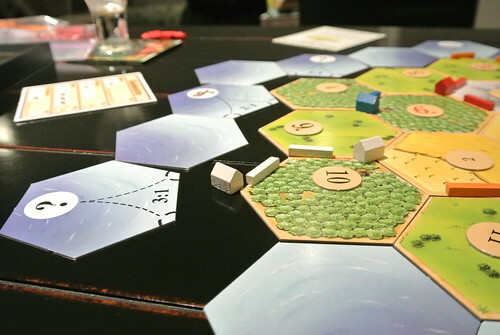 After dinner, I thought you were going to boycott Settlers of Catan, or perhaps this is how you filed the objection? Fortunately, N won quickly and we were able to take a break to have pie, found pumpkin cheesecake, coffee, and eggnog. A quick game of Guillotine later, we were Done. Happy Thanksgiving! A favorite Russian food of mine is blini (bliny), little Russian pancakes. The round crepe-like pancakes are traditionally eaten at maslenitsa to welcome the return of the sun. 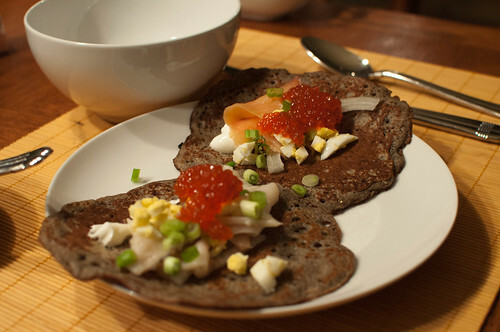 Maslenitsa happens at the end of winter or just before Lent, so N has often resisted making blini outside of that time. Tradition... but I don't see why we can't eat them multiple times a year, especially in a sun-starved Seattle fall! N and I prefer the buckwheat version of bliny, and N made the dough following a recipe similar to this one at theKitchn. Topped with any combination of smoked fish, chopped hard-boiled egg, onion, sour cream, caviar -- yum! They can also be filled with jam if you're in the mood for a sweet treat. N bought a collection of smoked fish at Arbat, a Russian grocery store in Kirkland. I didn't recognize one of the fish in the package and dug into the trash to check the label. Escolar. Huh. I broke a self-rule and googled the fish from my phone at the table, and I am glad I did! The first hit was this blog post, Use Caution When Eating Escolar! Escolar, butterfish, waloo: also nicknamed "ex-lax fish" and "Olestra fish" for reasons you can guess. Yikes! Take away: don't eat more than 6 ounces in a sitting and it's ok to search the web about food you're unsure about before eating. Pelmeni are boiled Siberian dumplings, served many different ways. We prefer a combination of beef broth, vinegar, and hot Russian mustard, maybe a touch of melted butter (without water). Wintry comfort food to be sure. 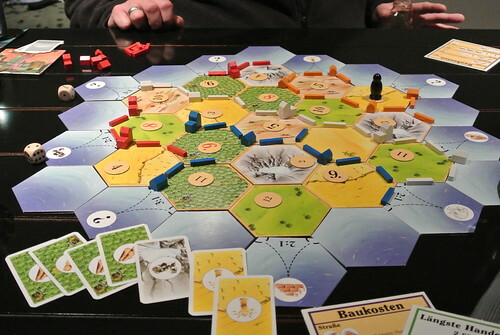 After dinner, we played a round of Settlers of Catan. Again! When will it end? I had a horrible game, but you pulled off a win, with the largest army! 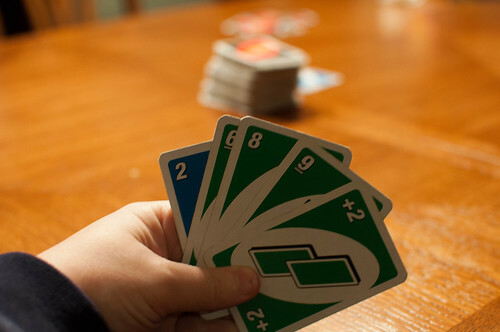 After a treat of pumpkin ice cream and ginger snaps, we were too full to play anything other than a game of Uno. 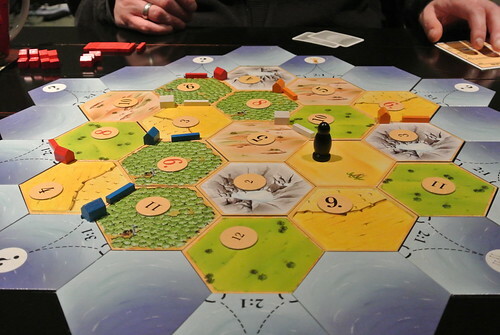 Would it be wrong to misplace our copy of Settlers of Catan? I am not from the South. But, I like Shrimp and Grits, a lot, especially Where ya at Matt's. It is so delicious. 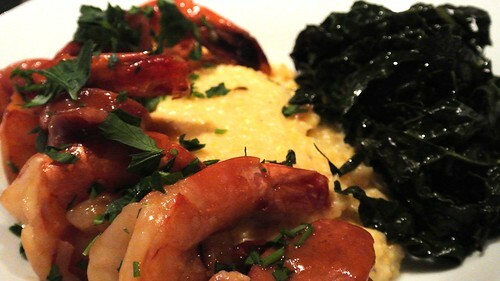 While I do not have any hope to recreate his, I wanted to try to make a tasty shrimp and polenta. There are numerous discussions on the best grits, like this thread on Chow. I refrained from ordering grits from Anson Mills, this time, and opted for a locally available Bob's Red Mill's corn grits polenta, and improvised from these two recipes: Shrimp and grits from Bon Appétit and Cheesy Polenta from Giada De Laurentiis. For the shrimp, I started by sauteing shallots, bacon, and linguisa together. After the meats render some fat, removed meats, and tossed in the shrimps. When the shrimps start to turn pink, and before they are cook through, I removed them from the pan. Then deglace with a little of the yummy fish stock from N's cioppino, (flat leftover!) beer, a couple of bay leaves and sprigs of thyme. Reduced the liquid, returned shrimp and meats to pan to warm up and finish cooking. Served with cheesy polenta, made with whole milk, a lot of extra sharp white cheddar and parmesan, a shot of the yummy fish stock, and sprinkle of oregano. Polenta is tricky to me. Even though I knew it would set up after resting, I still miss calculated and did not add enough liquid to get the consistency I was looking for, it was just a little thick. Some Tuscan kale was simply sauteed with bacon to go with all the cheesiness. I tried a trick to leave the garlic cloves whole, to flavor the greens, but not ... incur the side effect of garlic. 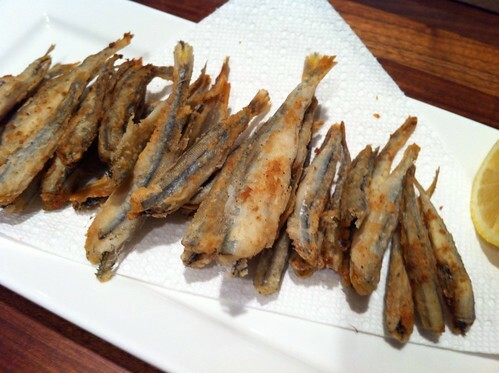 I was surprised there were still little smelts hanging around when I finished my giant bowl of food. Jing Jing, the nearby Asian Market always have these little fish. These were drench with half flour and cornstarch, salt and pepper , and simply pan fried. Mmm. Like. Really. Seriously. 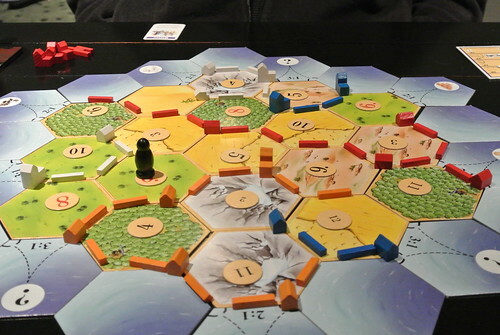 Another two games of Settlers of Catan. picking starting positions is tricky, I failed miserably this time. is that J, winning, again? who pull the block-you move? and who got frustrated?! 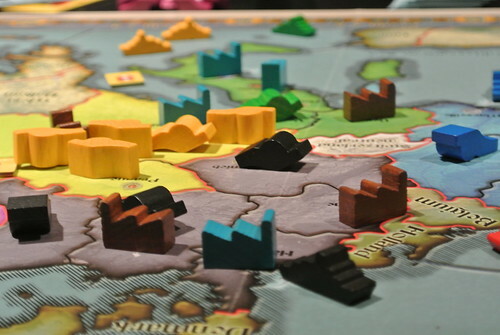 All the nations are played, regardless of number of players. Each nation (not players) may hold bonds of other nations. Taxation, where occupying nations tax their subjects. 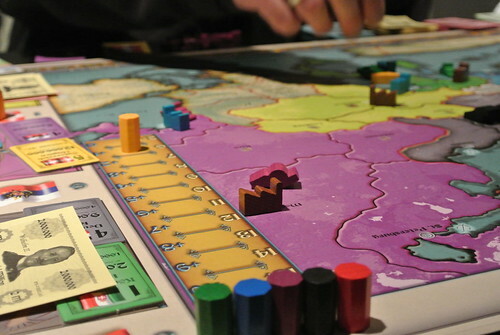 Players and nations (and bank) hold money. 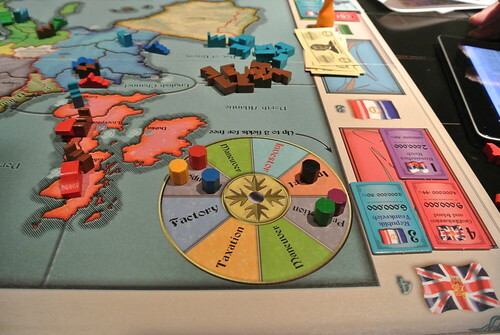 Player can use his/her money to pay for items for a nation.Conversely, if a nation is broke, the player who controls the nation pays the debt (i.e. tax, interest, etc) from their personal money. 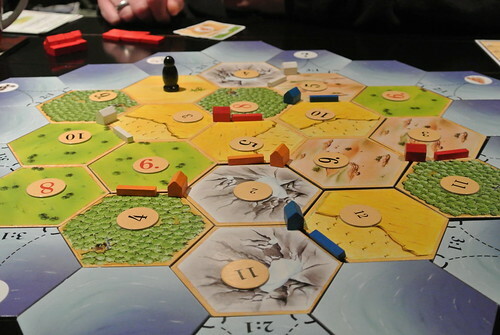 Players on each turn, plays as his / her nations. There is no one to one relationship between player and nation. Definitely ready for another trial game. Halloween passed. Daylight Savings Time ended. 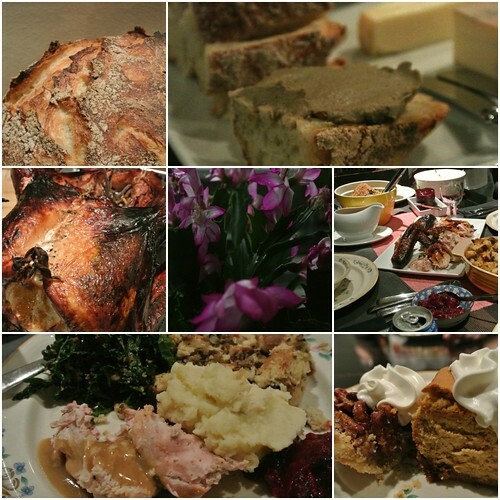 It is November, time to think about Thanksgiving.